In this issue, Shelf Awareness introduces the first Bookseller Wisdom column--a selection of frontlist and backlist titles on a particular subject that were recommended by booksellers knowledgeable in the area. Subjects can involve topics in the news, trends, personalities, historical anniversaries--or just because. Our inaugural column (see Deeper Understanding, below) focuses on titles about World War I, which began 100 years ago this week. Barnes & Noble has elected retired U.S. Navy Vice Admiral John R. Ryan to the board. 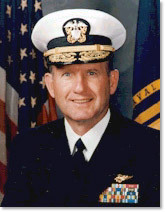 Ryan served in the Navy from 1967 to 2002 and is president and member of the board of governors of the Center for Creative Leadership. Previously, he was superintendent of the U.S. Naval Academy from 1998 to 2002, chancellor of the State University of New York from 2005 to 2007 and president of the State University of New York Maritime College from 2002 to 2005. He is also lead director of CIT Group and has been a board member of Cablevision Systems since 2002. B&N, which aims to split into two companies, emphasized that as a Cablevision director, Ryan has "substantial experience serving on public company boards undergoing strategic transactions such as separations," including Cablevision's sales and spinoffs of Madison Square Garden, AMC Networks, Clearview Cinemas and Optimum West. Banned Books Week, September 22-28, will again feature a virtual read-out of banned and challenged books. Individuals, libraries and bookstores can upload videos for the Banned Books Week YouTube Channel. Contributors are encouraged to share a reading, discuss the significance of their favorite banned book or mention a local book challenge. More than 1,500 videos have been submitted since the read-out began in 2011, including many by bestselling authors. (Sherman Alexie, Laurie Halse Anderson and Kahled Housseni are contributing new videos.) Bookstores and libraries across the country are already participating in the Virtual Read-Out. Bookmans Entertainment Exchange in Arizona produced the video "Bookmans Does Banned Books," and the Mooresville (Ind.) Public Library produced two promotional trailers. The Virtual Read-Out will serve as the backdrop for the announcement of Banned Books Week Heroes, honoring individuals and groups who have stood up to defend their freedom to read. For the first time, this year Twitter parties will help promote the message of Banned Books Week. The first party will be held on Monday, September 23, from 10 a.m. to noon, Eastern; a second party takes place Wednesday, September 25, from noon to 2 p.m., Eastern. Supporters are urged to tweet using the hashtag #bannedbooksweek. And as always, bookstores and libraries will hold events and make displays related to Banned Books Week. Sponsors of Banned Book Week are the American Library Association, the American Booksellers Foundation for Free Expression, the American Society of Journalists and Authors, the Association of American Publishers, the Comic Book Legal Defense Fund, the National Association of College Stores, the National Coalition Against Censorship, the National Council of Teachers of English, PEN American Center and Project Censored. Apple has acquired BookLamp, a book analytics/recommendation startup whose "most well-known product was the Book Genome Project, a platform that let users find suggestions for books to read based on natural language analysis of other titles," TechCrunch reported, adding that BookLamp's "tech and talent could help Apple improve its iBooks service with better recommendations, search, and categorization." In a statement confirming the acquisition, Apple said it "buys smaller technology companies from time to time, and we generally do not discuss our purpose or plans." TechCrunch also noted that when BookLamp "announced in April that it would be shutting down the Book Genome Project, it described the closure in vague terms, thanking users for being a part of its 'journey to date' as the company 'evolves its mission.' "
The Bookseller said Apple's purchase could be "a bid to match Amazon in the book recommendations field; Amazon acquired Goodreads in April last year, and it is now incorporated into the new Amazon devices." Brian Innes, a musician who "held down a series of day jobs in publishing," eventually became a founding partner of Orbis Publishing (which was sold to Robert Maxwell's Pergamon Press) and later moved "to the south of France where he poured out a stream of books, mostly in the true crime genre," died July 14, the Guardian reported. He was 86. For several years, Innes chaired the Crime Writers' Association's nonfiction Dagger award committee. Louise Shivers, whose 1983 debut work, the novella Here to Get My Baby Out of Jail, was a surprise bestseller, died on Saturday. She was 84. The New York Times said that the book is "set amid the tobacco fields of North Carolina in 1937. Its first-person narrator is Roxy Walston, the 20-year-old wife of a tobacco farmer and the mother of their 2-year-old child. Restless and unfulfilled, Roxy is, in her own words, 'unstrung, unquieted, my heart like a grape stain with no wine made.' " Shivers published another novella, A Whistling Woman, in 1994. She was a longtime writer in residence at Augusta State University, now known as Georgia Regents University, in Augusta, Ga. 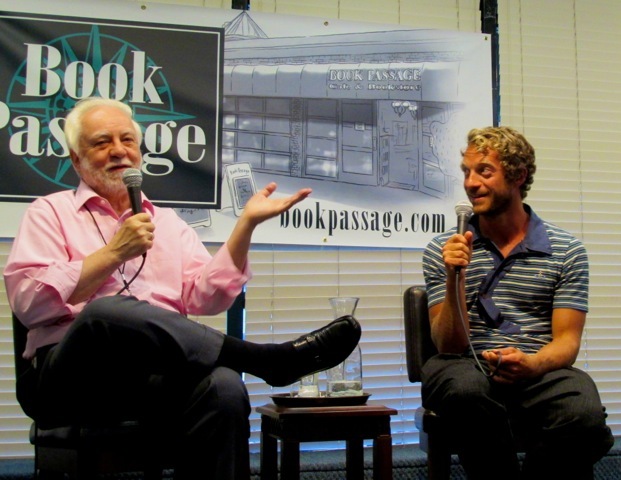 The 21st annual Book Passage Mystery Writers Conference took place this past weekend in Corte Madera, Calif., featuring a variety of classes, panels and literary conversations. Pictured: (l.) faculty member Otto Penzler--editor, proprietor of the Mysterious Bookshop in New York City and founder of the Mysterious Press--in conversation with author Tom Rob Smith. Happy 30th Birthday, Books on the Common! 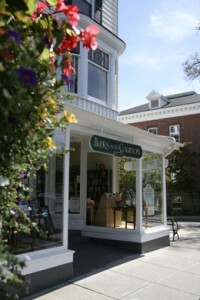 As Books on the Common, Ridgefield, Conn., marks its 30th anniversary, the Ridgefield Press offered a long feature on the store, which was founded by Bob and Sally Silbernagel and has been owned for the past decade by Ellen Burns and Darwin Ellis. The store moved in 2009 to its present location in the center of town, which has made a world of different. At its old location, "we always felt left out," Burns told the paper. "Now, we get a great amount of foot traffic with so many people visiting Ridgefield and walking its Main Street; we're a part of the downtown scene, which is a real positive. We get to see the kids skipping down the aisles; it's nice to see that level of excitement." I think it is to encourage literacy in our community and be a place where people can come together--people who love books--to buy books, but also to talk about books, to meet authors. How big was your staff when you started? How about now? It was my parents [Ralph and Nancy Titcomb, who founded the bookstore in 1969], my grandmother she helped out into her 90s. We are now on four generations. And all of the kids. Right now, we have about 12 people (with extended family helping out when needed). We think about that a lot. We try to think five years forward. Things keep changing faster and faster. We have a marvelous staff and, for the most part, we keep our eyes open and just continue with what we are doing. We have hosted some authors that I truly admire and they are definitely highlights (such as Henry Winkler and Mary Oliver). Being involved with Sandwich Reads Together and hosting people (such Alice Hoffman and Richard Russo). And also, I have to say, just walking around the corner and seeing a child read the book. Last Saturday, the river's end bookstore, Oswego, N.Y., partnered with the city's YMCA for the Kids Fun Run, with the theme "Get Fit & Literate!" A portion of the $5 registration fee helped support the new Oswego bookmobile, and the first 100 entrants received a T-shirt. Brenda Marsh has joined Abrams in the newly created position of v-p, business development. The position will focus on both new and existing business opportunities, market analysis and company growth initiatives. Most recently, she was v-p, author relations, at Barnes & Noble. Gwyneth Stansfield has been promoted to senior publicist at Scribner. She was formerly a publicist. Kyle Radler has been promoted to associate publicist at Scribner. Radler was formerly a publicity assistant. The Slaughter: Mass Killings, Organ Harvesting, and China's Secret Solution to Its Dissident Problem by Ethan Gutmann (Prometheus Books). This morning on Imus in the Morning: Douglas Brinkley, co-author of The Nixon Tapes: 1971-1972 (Houghton Mifflin Harcourt, $35, 9780544274150). He will also appear on Morning Joe and Hardball with Chris Matthews. Today on Fresh Air: Robert Timberg, author of Blue-Eyed Boy: A Memoir (Penguin Press, $27.95, 9781594205668). Tomorrow morning on Morning Joe: John W. Dean, author of The Nixon Defense: What He Knew and When He Knew It (Viking, $35, 9780670025367). He will also appear on MSNBC's the Cycle. Tomorrow on NPR's Diane Rehm Show: Peter van Agtmael, author of Disco Night Sept. 11 (Red Hook Editions, 9780984195428). Tomorrow on Tavis Smiley: Robin Roberts, co-author of Everybody's Got Something (Grand Central, $27, 9781455578450). The latest teaser trailer for The Hunger Games: Mockingjay, Part 1, "has arrived and it's intriguing, but more focused on world-building than outright thrilling," Indiewire noted. "It appears that Lionsgate wants to slowly build the campaign rather than run out of the gate all guns blazing.... It's nearly bold and almost counterintuitive as a teaser, but it's also just a minute long. Regardless, it's compelling and Catching Fire definitely showed this series as a franchise on the rise that had markedly improved." The movie, directed by Francis Lawrence, hits theaters November 21, while the final installment, The Hunger Games: Mockingjay, Part 2, arrives November 20, 2015. The first trailer for The Hobbit: The Battle of the Five Armies debuted at Comic-Con over the weekend and is, "to say the least, serious and seriously action-packed, with the whole world going to hellfire," the Wrap reported. Peter Jackson's "third film in the single book-derived big-screen trilogy (and, of course, Jackson's sixth film adaptation of author J.R.R. Tolkien's fantasy saga)" stars Martin Freeman, Benedict Cumberbatch (his voice, at least, as Smaug), Evangeline, Richard Armitage, Orlando Bloom and Ian McKellen. The first full-length trailer for Alexandre Aja's Horns, based on the novel by Joe Hill and starring Daniel Radcliffe, Juno Temple, Max Minghella, Joe Anderson, James Remar and Kelli Garner, "promises some moody stuff, with Radcliffe trying a different accent too," Indiewire reported. The winners of the 2014 Will Eisner Comic Industry Awards, presented during Comic Con in San Diego, can be seen here. Richard Bausch's novels and story collections have earned him impressive critical recognition, including a PEN/Malamud Award and a National Endowment for the Arts grant, settling him firmly among our finest contemporary writers. The Guardian praised him for having "a devastating concern for detail and domestic complexity, the ability to lay bare the convolutions, eccentricities, dangers and beauties of 'ordinary' people." Bausch (Peace; Thanksgiving Night) displays no less in his 12th novel, Before, During, After. Natasha is a young congressional aide in Washington, D.C., with a checkered romantic history. A chance meeting at a dinner party in spring 2001 leads to a relationship with Michael Faulk, 16 years her senior and an Episcopal priest undergoing a crisis of faith and calling. They fall in love over the course of the summer and set their wedding for fall. On September 11, Michael is in New York with breakfast plans at Windows on the World in the World Trade Center while Natasha is on vacation in Jamaica. In the ensuing communication blackout, Natasha believes Michael among the dead. Distraught, disoriented and intoxicated, she is raped by a fellow vacationer. She is paralyzed by trauma and shame and cannot share her experience with Michael when they are finally reunited. Michael interprets her withdrawal as a consequence of infidelity. Their relationship slips into one of secrets, suspicion and resentment, until it becomes unendurable. Bausch's focus moves seamlessly from Michael to Natasha, providing both characters' points of view. His narrative voice is patient, compassionate and observant, noting the small details that anchor the story in a concrete, fully realized world. Michael and Natasha are flawed in their own distinct ways, with quotidian human weaknesses. Michael's seriousness can make him remote and self-indulgent, Natasha can be too impulsive; both insulate themselves from the difficult work of being alive with too much whiskey and too much retreat. But Bausch never judges them. He is not interested in whether their human limitations played a role in their devastating trauma; he concentrates on their pain and how they might find their way back to one another. Shelf Talker: One of our finest contemporary writers delivers a gorgeous, emotionally complex novel about the personal consequences of a national tragedy. This week marks the 100th anniversary of the start of World War I, when the Austro-Hungarian Empire invaded Serbia in retaliation to the assassination of Archduke Franz Ferdinand on June 28. By the end of the war in 1918, some 16 million people had been killed and the maps of Europe and the Middle East were redrawn. To help commemorate one of the deadliest conflicts in human history, Shelf Awareness has compiled, guided by several booksellers with a deep interest in the subject, a selective list of titles, including frontlist and backlist fiction, nonfiction and children's books, about the Great War. River of Darkness by Rennie Airth (Penguin Books, $16, 9780143035701). The protagonist of River of Darkness is Inspector John Madden, a Scotland Yard detective and traumatized World War I veteran. He has also lost his wife and young daughter to an influenza outbreak, and in this damaged condition he's assigned to track down and apprehend another veteran of the Great War, a former soldier who kills a family with a bayonet. Under Fire: The Story of a Squad by Henri Barbusse, translated by Fitzwater Wray (Penguin Classics, $16, 9780143039044). Based on his experience as a volunteer soldier in World War I, Barbusse tells the story of ordinary men who are themselves fighting in the French Sixth Battalion. In visceral detail, Barbusse describes the horrific, hellish conditions of trench warfare and their effect on the human psyche. The novel is considered a classic in the vein of Hemingway's A Farewell to Arms or Remarque's All Quiet on the Western Front. Consisting of Regeneration (Plume, $16, 9780142180594), The Eye in the Door (Plume, $16, 9780452272729) and The Ghost Road (Plume, out-of-print, 9780452276727), Pat Barker's critically acclaimed trilogy explores the psychological trauma of World War I. The novels seamlessly blend fact with fiction: historical figures such as Siegfried Sassoon, W.H.R. Rivers (who pioneered treatments for shell shock during World War I) and Wilfred Owen are major characters, interacting freely with Barker's purely fictional creations. The final book in the trilogy won the Booker Prize in 1995. Mark LaFramboise called the trilogy "just extraordinary. It's one of a kind as far as literary takes on World War I go." Waiting for Sunrise by William Boyd (Harper Perennial, $15.99, 9780061876776). Boyd's 2012 literary thriller is about Lysander Rief, a young British actor who becomes embroiled in scandal and espionage in Vienna at the start of World War I. He is in Vienna to visit a psychoanalyst, a disciple of Sigmund Freud. Rief winds up in jail and is released by the British Foreign Service, but he'll have to work for them undercover in exchange for his freedom. Mark LaFramboise commented: "The book does frontline soldiering but also the clandestine, cloak and dagger spy stuff of World War I. And Boyd is just a terrific, terrific writer." The Cartographer of No Man's Land by P.S. Duffy (Liveright, $25.95, 9780871403766). Angus MacGrath, a ship's captain from Nova Scotia, enlists with the Allied Forces after his brother-in-law goes missing on the front lines. MacGrath assumes that he'll work in safety as a cartographer in London while helping to find his brother-in-law; instead he becomes an officer in the trenches, contending with mustard gas, machine guns, mud and despair. Parade's End by Ford Madox Ford (Vintage, $19, 9780307744203). Ford's tetralogy (Parade's End comprises four separate novels) recounts the life of Christopher Tietjens, a statistician from a rich land-owning family, who serves in the British army in World War I. Ford is less concerned with graphic, visceral depictions of battlefields than mining the consciousness of his lead characters. "This is one of my all time favorite books," said Tom Gartner. "It's not just about the war per se but also what was going on in England--it so captures that era. And the style is so beautiful." In Pale Battalions by Robert Goddard (Delta, $12, 9780385339209). Goddard's 2007 novel focuses on three generations of women in a single family: Leonora, her daughter (also named Leonora) and Penelope. The story begins with the younger Leonora taking Penelope to a memorial to those killed on the Somme. There, they see Leonora's father's name, but it's made clear that he died a full year before Leonora was born. From there on, Penelope begins to unravel the mysterious lives of her mother and grandmother. "He takes some liberties," said Tom Gartner, "but he really delves into the politics of the time in an interesting way." A Soldier of the Great War by Mark Helprin (Mariner Books, $16.95, 9780156031134). Through the life of Alessandro Giuliani, Helprin provides a sweeping overview of World War I and the decades immediately before and after. The novel opens 50 years after the war, in August 1964, when Alessandro is an old, distinguished professor. He meets a young factory worker and gradually recounts his history: as a wealthy, privileged young man at the turn of the 20th century, his experiences in the war, and his years spent wandering after he deserts the army. Deafening by Frances Itani (Grove Press, $14, 9780802141651). Grania O'Neill, the heroine of Itani's 2003 novel, catches scarlet fever as a child and loses her hearing. In adulthood, she falls in love with a hearing man who has a beautiful singing voice. After war breaks out, he is sent to fight in Europe while she must wait for him in Canada. "We were crazy about this book when it came out," said Margaret Brennan Neville. "She's isolated by silence, he's isolated by sound. The scenes about the war are horrific and powerful all at the same time." The Sojourn by Andrew Krivak (Bellevue Literary Press, $14.95, 9781934137345). Based on Krivak's own family history, this novel tells the story of Jozef Vinich, who emigrates with his family to a rural mining town in Colorado in the late 19th century. After Jozef's mother dies in a railway accident, Jozef's father decides to take the rest of his family back to Austria-Hungary. In 1914, Jozef is conscripted into service on the southern front. "It's a small, almost quiet novel," said Margaret Brennan Neville. "It's not told from our side. But on the ground, you can't really tell the difference. It's very powerful." Memoirs of a Fox-Hunting Man; Memoirs of an Infantry Officer; Sherston's Progress by Siegfried Sassoon (Penguin Classics). Though technically fiction, Sassoon's trilogy is based heavily on his own experience in World War I. Memoirs of a Fox-Hunting Man ($16, 9780143107156) hardly features the war at all; instead it recounts George Sherston's (Sassoon's fictional alter-ego) life as a young waster in England before the war. Only towards the end of the novel is he actually sent to the frontlines. Memoirs of an Infantry Officer ($15, 9780143107163) deals principally with Sherston's time in the trenches in mainland Europe, while Sherston's Progress ($15, 9780143107170) is about the time he spends being rehabilitated from shell shock. Tom Gartner called the trilogy "a brilliant capturing of the time." August 1914 by Aleksandr Solzhenitsyn (new edition from Farrar, Straus & Giroux coming August 19, $22, 9780374534691). The first part of Solzhenitsyn's Red Wheel series, August 1914 focuses on the outbreak of World War I and the defeat of the Imperial Russian army at the Battle of Tannenberg in East Prussia. That decisive, crushing loss helped precipitate the 1917 Revolution and the fall of the Tsars. The lengthy novel blends fictional characters and plotlines with historical fact. An expanded edition, released when Solzhenitsyn was living in the U.S., includes chapters on Vladimir Lenin and Tsarist Prime Minister Pyotr Stolypin. A Century of November by W.D. Wetherell (University of Michigan Press, $15, 9780472031221). 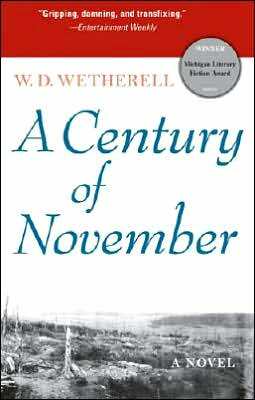 Shelf Awareness reviews editor Marilyn Dahl considers A Century of November to be "one of the finest World War I novels ever written." It is the story of Charles Marden, a widower, farmer and magistrate on Vancouver Island, who journeys from Canada to Belgium after hearing of his son Billy's death on the front lines. Although he is initially denied access to the battlefield by British authorities, the sudden end of the war allows him to visit the exact spot where his son died. In her review, Dahl wrote: "Yet in the midst of pain and loss, this is a story of hope and redemption in a desolate world. 'Luminous' is an overused word in reviews, but A Century of November more than deserves the word."